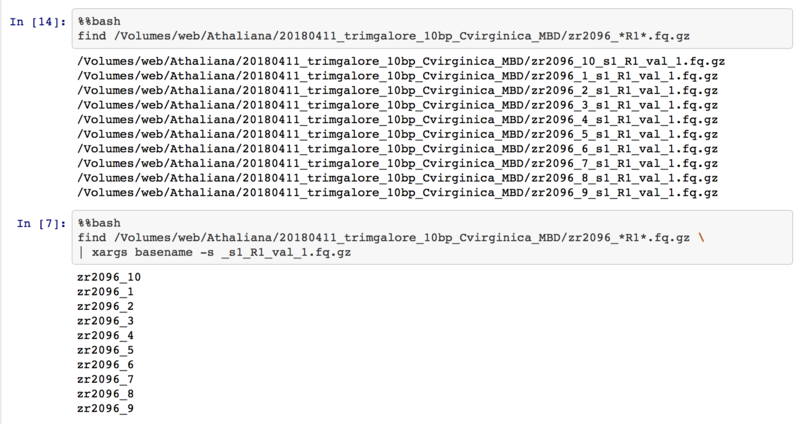 Now that I’ve tested the entire bismark to methylKit pipeline on a 10,000 read subset for each C. virginica sequencing sample, I can begin validating the full pipeline. Steven already ran the full samples on this pipeline in this notebook. My job is to reproduce his workflow. I opened my full pipeline Jupyter notebook. 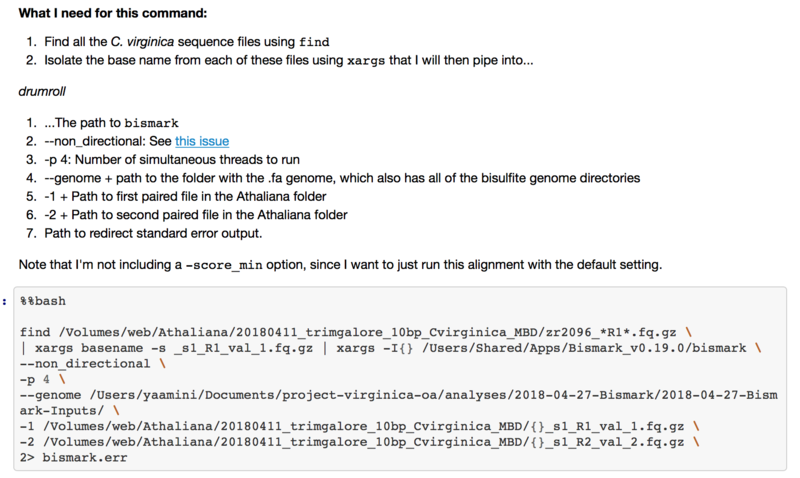 Since I’m using trimmed files from this directory, the first thing I wanted to do was test my find and xargs commands to ensure I isolated the right files. Figure 1. Testing find and xargs on a new set of filenames. Then, I piped the find and xargs output into bismark. Unlike Steven, I did not set a parameter for -score_min. In our conversation today, we decided that I should run the alignment with the default parameter so we can compare our results. The default is L,0,-0.2 (instead of L,0,-1.2 used by Steven). Figure 2. Description of each line of code, along with the actual command. I’ll check on the alignment progress tomorrow, but my guess is that this will take 2-3 days to complete. Once the alignment is finished, I will deduplicate, sort, and index the resulting .bam files. My goal was to run my samples through Steven’s methylKit R code. The first thing I did was copy his code into this R script. I then added more descriptive names for the objects, and commented out each line of code so I understood what was happening. I was able to run processBismarkAln on my deduplicated.sorted.bam files! However, I could not unite these files. That’s when I posted a Github issue. After some back-and-forth, Steven suggested I download some of his dedup.sorted.bam and run those files through the R script. By using his files, I could figure out if the unite issue stemmed from my files, or from software differences on the Mac mini. Either way, Steven said I should move on to the full pipeline and validate everything. Sam and Steven both pointed me to this directory, which has the trimmed files. He also said that I should remove the -score_min argument. This will make bismark run the default setting for alignment mismatches, and allow us to compare the alignment results. Time to start a computer process that will take several days to run!